The North Shore Upload Form is built on HTML5 using the Plupload JQuery Plugin. 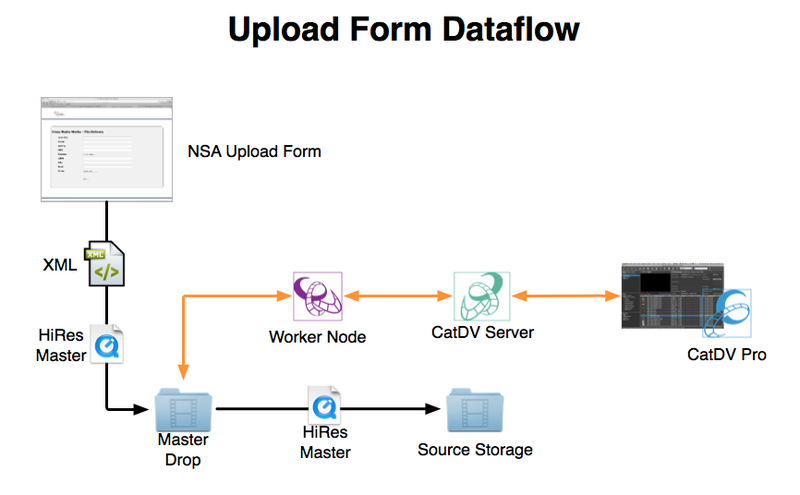 The form allows users with no access to CatDV Pro to upload assets to a CatDV system, with atached metadata, using only a web form. This is useful when receiving files from users outside your department or production or perhaps even from outside of your organization altogether, depending on your security requirements/restrictions. The workflow is that the user is presented with a web form where they may enter data. Once the data is entered (fields may be set as "required") the user selects a file to upload and initiates the upload operation. Once the file is delivered, the Upload Form outputs an XML file to match the uploaded file and both files are delivered to a selected Worker Node watch folder where the file and metadata are ingested into CatDV with no user action required from the receiving party. Once ingested, the file is available in CatDV for further automated actions or notifications. IN-PROGRESS - contact support@northshoreautomation.com for more info. NSA form is uses chunked uploads to get around the http upload max file size limit for web uploads. To edit the form setting, open the file named upload.php in your form web directory. Refer to line 101 “chunk_size”. By editing this value you change the chunk size. Note: As mentioned above, make sure you do not set this value to a size larger than the maximum upload file size that your server will accept. The base product includes no user management or access control. It is intended for use by a limited number of known users and is typically secured with a simple .htaccess file. If you require user management and/or more granular access control, please contact your reseller or North Shore to receive a quote for a custom version of the form. The web form utilizes standard http protocol for uploads. No transfer acceleration is provided. If you need to accelerate uploads, North Shore recommends one of our web form integrations with File Catalyst or Aspera.